Dr. Wilmarth and NovaBay Pharmaceuticals roll out the red carpet for Gholam Peyman, MD inventor of LASIK and recipient of Presidential Medal of Honor. Professor Gholam Peyman, MD, a friend and associate of Stephen Wilmarth, MD and NovaBay Pharmaceuticals, was awarded the Presidential Medal of Honor at the White House for inventing LASIK. 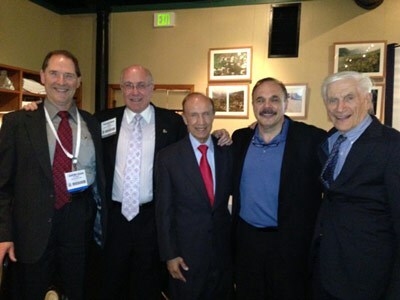 At the recent American Society of Cataract and Refractive Surgery Annual Meeting, Dr. Wilmarth and NovaBay Pharmaceutical invited Dr. Peyman’s and many of his close friends to an Awards Dinner in appreciate of his many contributions to ophthalmology. Professor Peyman holds over 135 patents in ophthalmology and created many of the techniques and technology that are a foundation of modern eye surgery. It’s a sincere pleasure to work with Dr. Peyman and call him our friend.